Making and fitting doors to cabinets is perhaps one of the most challenging tasks I have been faced with. Last years I had started work on a Teak cabinet but had abandoned it after completing the carcass and shelves. The job of making and accurately fitting the doors/shutters proved too daunting. This week, however, I decided it was time to make the shutters and shift the hulk of the unfinished cabinet to my study where it was most needed. I had recovered after a prolonged bout of viral fever and even an hour of easy woodworking was tiring. It was perhaps the enforced patience that finally worked. The first step as usual is getting and milling the rights pieces of wood. In this case, I was fortunate to have two long 2 ½ inch by 1 inch by eight feet long strips of milled Burma Teak. It was then a case of carefully measuring the door dimensions and then getting to the business of cutting mortises and tenons. This is always a slow business with hand tools, at least for me. 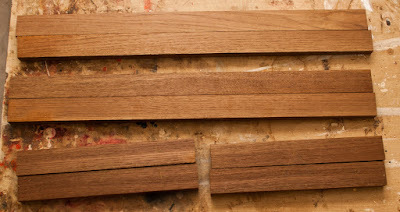 Next, I measured and cut the hinge mortises on the cabinet as well as the shutters. 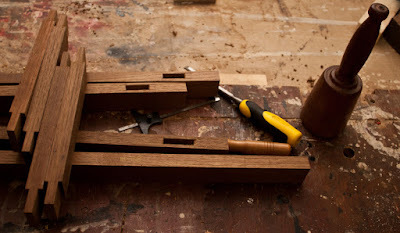 If the mortises are not cut correctly, then the shutters will not align properly. Then it took quite a bit of fiddling, planning, fitting and re-fitting to ensure a decent fit with a consistent reveal on all sides. It was perfect in the end as one of the shutters had a 1/32nd inch incline at the point where it met the other. It wasn't glaringly bad but could've been better. The shutters were tested by attaching the hinges with screws and everything worked well. 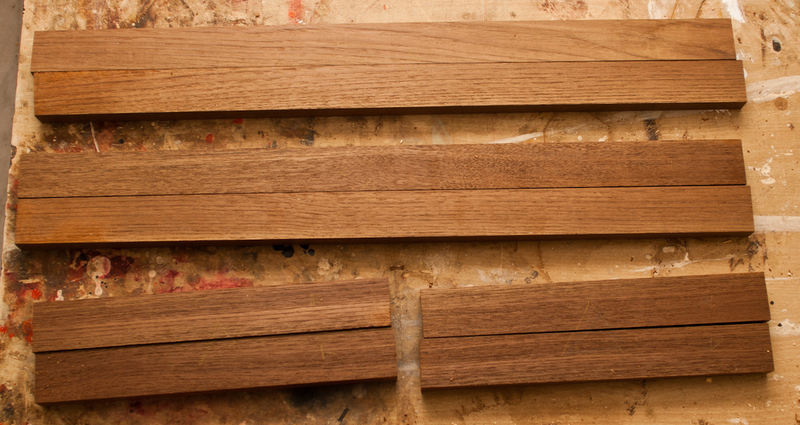 I had to next chisel and plane two lips along the mating edges of the shutter. This ensures a tight fit and hopefully makes the interiors somewhat dust proof. 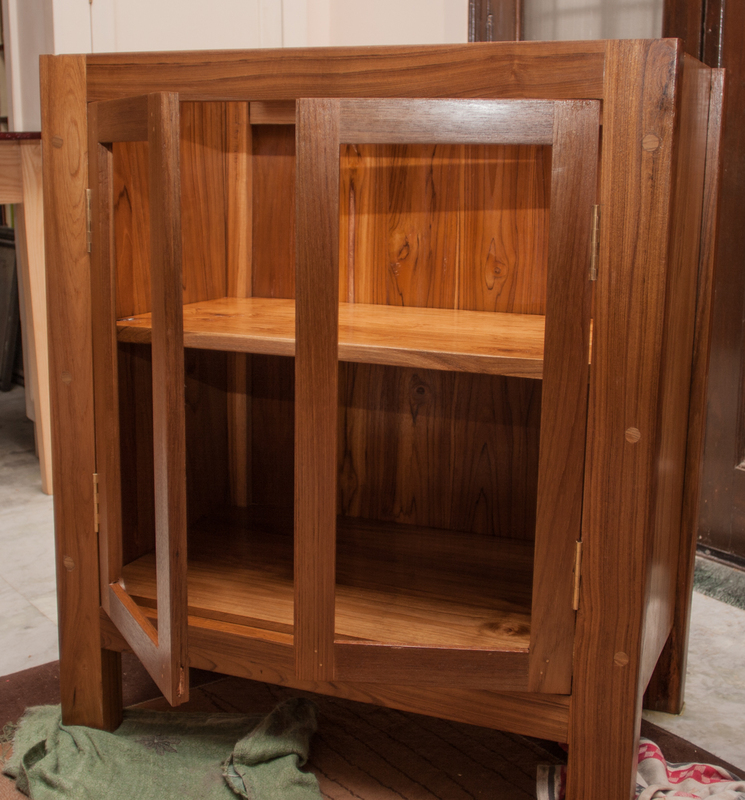 Now the cabinet needs glass for the shutters and a top which is almost ready. But that will have to wait till I am fully recovered. Very beautiful done reminds me of krenov style cabinet. Manoj, prices of wood vary widely across the country; it is impossible for me to do a countrywide survey to provide the information you want. But Rs 1,100 per cft of Pine is a total rip off, unless you have got some sort of super quality, four side square (milled) Pine planks. Do that - also take photos of the different types of Pine; it will help you compare in the long run.